The Wonderous Collection from Sweet Heart polish is inspired by Alice in Wonderland. I knew this immediately upon opening the package - take a look! How fun is that? It brought a smile to my face to see such thoughtful gifts and packaging for review polishes. I unwrapped the polishes and was even more happy because SPARKLES! Heaps of them beaming out of each bottle. What to wear first!? I chose the brightest and most sparkly of the bunch to wear first, I'm late! I'm late! I'm late! 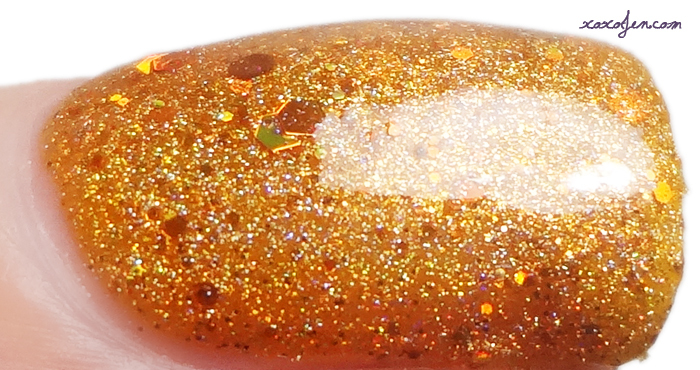 It's a vibrant juicy holo jelly packed full of shimmer and copper glitter. The color is not quite orange and definitely not yellow. It's namesake immediately reminded me of the white rabbit's pocket watch and how precious it was to him. This is, by far, my favorite fall polish and what a perfect name for it! I wore two coats and it was glossy on it's own but I added topcoat for quick drying. Off With Her Head! Named after the Queen of Hearts most famous line. In the Disney animated feature Alice in Wonderland, the Queen of Hearts is the main antagonist. She's described as a foul-tempered monarch, that Carroll himself pictured as "a blind fury", and who is quick to decree death sentences at the slightest offense. 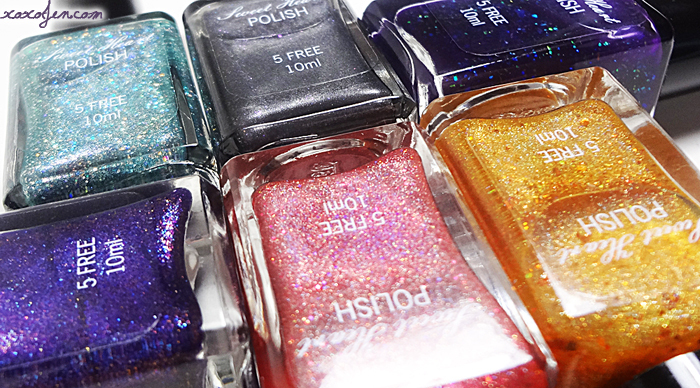 Perhaps this polish would brighten her day and attitude? 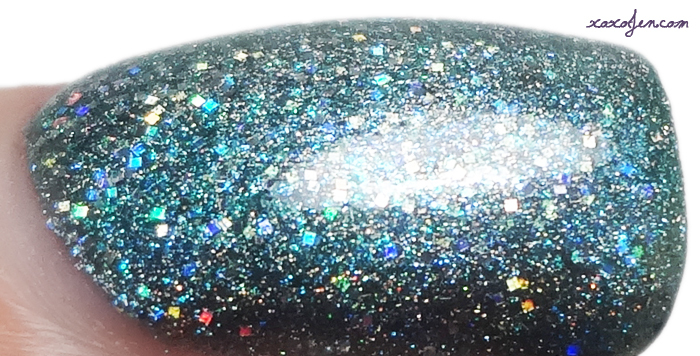 It's such a pretty corally shade packed with holo, shimmer and glitter. I wore two coats with topcoat, the formula was very easy to apply and control on the nail which resulted in very little clean up. She Must Be a Weed is the third holo, shimmery, glittery jelly polish in this set. A pretty shade of green with a light bit of blue makes this one kind of sea foamy. Thinking about this and the other two shades above, I realized they all represent the changing colors of leaves as we approach the fall season. Quite a clever mini collection within a collection, eh? I wore three coats of this one with top coat. "One Lump or Two?," the Dormouse offered. 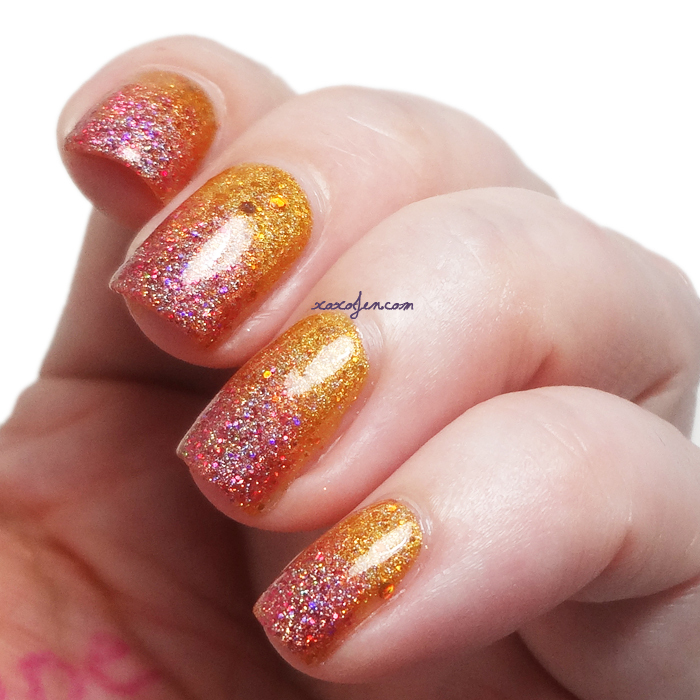 The line from this scene at the mad tea party really suits this polish in that the micro flakes look like sparkling sugar crystals. I wore three coats with topcoat for the photos. The formula was smooth and easy to control, this one is best applied in as few brush strokes as possible as it tends to start drying fairly quick. The large blue Caterpillar raised his head from his hookah and peered at her. "Who R U?" he asked through a cloud of smoke. In the Disney cartoon the puffs of smoke are all different colors and shaped like letters or symbols. Who R U? 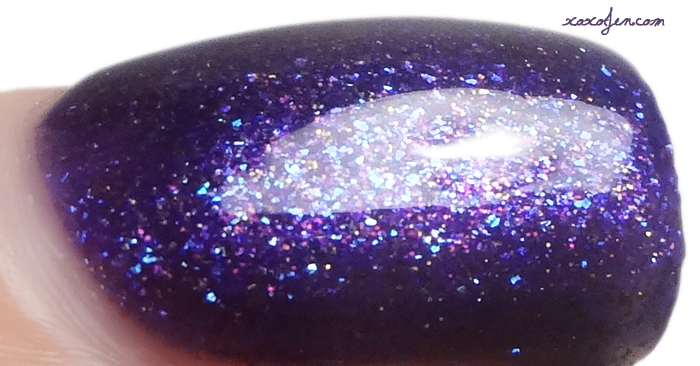 is such a fun representation of this scene with it's colorful flakies and violet jelly finish. I layered this on top of One Lump or Two? on my thumbnail and love the depth that it adds! If you get these, definitely try that. I wore three coats with topcoat. The formula was smooth and easy to use. Lastly is a special collection exclusive that is included only if you purchase the full collection. She's Stark Raving Matte is an edgy gunmetal grey shimmer with purple flecks throughout. I wore two coats alone in the first three images and then added topcoat in the last three. 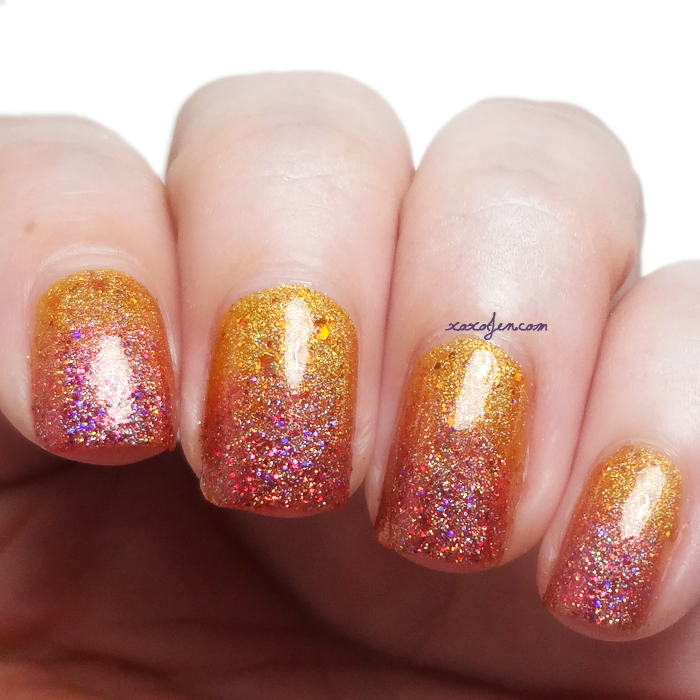 And just in case you're not yet convinced, I've created a gradient with I'm late! I'm late! I'm late! and Off With Her Head! I think it turned out beautifully and it was quite easy to do. I used I'm late! I'm late! I'm late! as the base color and when it was dried well, I sponged two coats of Off With Her Head on the tips, moving the sponge around a little bit to give the illusion of blending with I'm late! I'm late! I'm late! It took very little time to do and had a nice result. 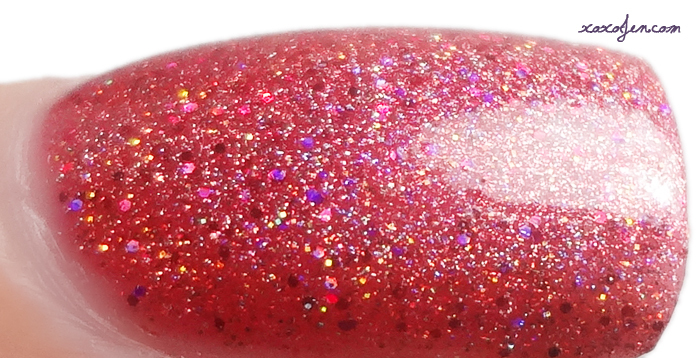 The full Wonderous collection will be available Friday October 16, at 11am Central time at the Sweet Heart Polish online store. If you've enjoyed my review, be sure to follow my page at facebook or other social media.